Along with class-based differences in the overall incidence of pursuing learning, there are differences across class lines when it comes to where learning takes place and how adults view its impact. For personal learning, the only significant difference emerges when looking at whether people used the internet for personal learning. Overall, 52% of personal learners used the internet for their learning, but there was a 15 percentage-point gap when looking at either end of the education spectrum and a similar gap for income. Some 58% of personal learners with college degrees or more used the internet for personal learning in the past 12 months, compared with 43% of personal learners who have high school diplomas or less. Similarly, 60% of personal learners living in households earning more than $75,000 used the internet for their personal enrichment activities, compared with 44% of the personal learners living in households earning less than $30,000. For professional learning, these class differences also emerge. Among those who pursue learning for their jobs or careers, most of this occurs at the workplace regardless of an individual’s education or income. However, those on the lower end of the socio-economic ladder (who are less likely to have such learning opportunities in the first place) are much less likely to do this online, at a convention or at a conference. When it comes to the impact of different kinds of learning, the learners with higher education levels and higher household income levels are also more likely than others to report reaping gains from their activities. Professional learners who had training or took classes for job-related activities herald how such training expands their professional networks. Fully 72% of professional learners who have college degrees or more say their extra learning expanded their professional network, compared with 50% of professional learners with high school degrees or less. 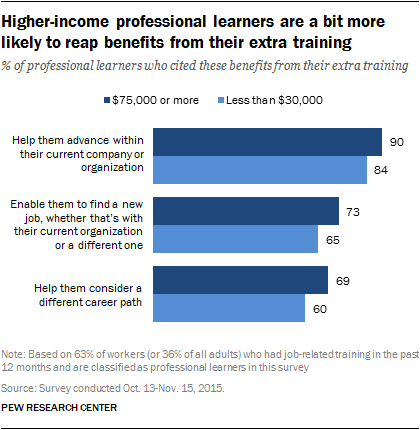 There are also modest differences between better off and less-well-off professional learners when it comes to other advantages of job-related education activities, including advancing in their companies or finding new jobs. Distance learning: This is a concept that has been around since the dawn of the internet, yet only 14% of Americans say they are “very familiar” with it and another 24% say they are “somewhat familiar” with it. Overall, about half of professional learners (53%) and personal learners (48%) say they are very or somewhat familiar with the concept of distance learning. Khan Academy: This is a website with thousands of short videos on dozens of academic topics, ranging from math concepts to history lessons to the art of Asia. Some 9% of adults say they are “very familiar” with the site and another 10% are “somewhat familiar” with it. About a fifth of professional learners (23%) and personal learners (22%) are very or somewhat familiar with Khan Academy. MOOCs: These are “Massive Open Online Courses” that especially came to prominence in the college world in 2008-2009. They caught wide attention as courses could potentially open to limitless numbers of students around the world. Sometimes the courses have been offered for free and sometimes organizations have charged students. In this survey, 5% of adults said they were “very familiar” with MOOCs and another 13% said they were “somewhat familiar” with them. Some 25% of professional leaders said they were at least somewhat familiar with MOOCs and 22% of personal learners were somewhat familiar. Digital badges: These are symbols that are meant to certify that someone has accomplished something or mastered some knowledge. They might cover anything from acknowledging that someone has completed a marathon to affirming that someone is competent at using social media. Some 4% of adults say they are “very familiar” with digital badges and another 12% say they are “somewhat familiar.” About a fifth of professional learners (21%) and personal learners (18%) say they have at least some familiarity with digital badges.